Equi-Venture Farm's Hunter Holloway and Cassevel, owned by Hays Investments. 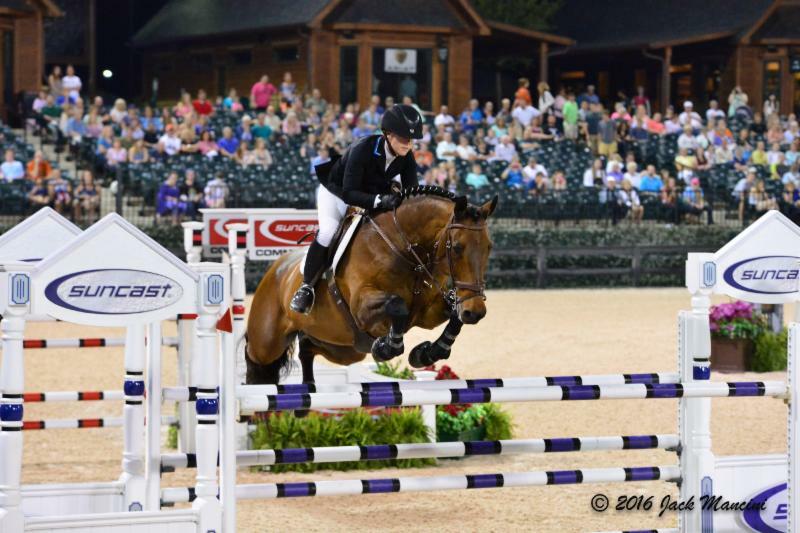 Mill Spring, NC - May 31, 2016 - Hunter Holloway of Topeka, KS, concluded a stellar week at Tryon International Equestrian Center (TIEC) during Tryon Spring 6, picking up major wins in the $25,000 Under 25 Grand Prix on Friday, May 27, aboard VDL Bravo S, and earning her biggest career win to date in the $75,000 Tryon Resort Grand Prix with Cassevel. 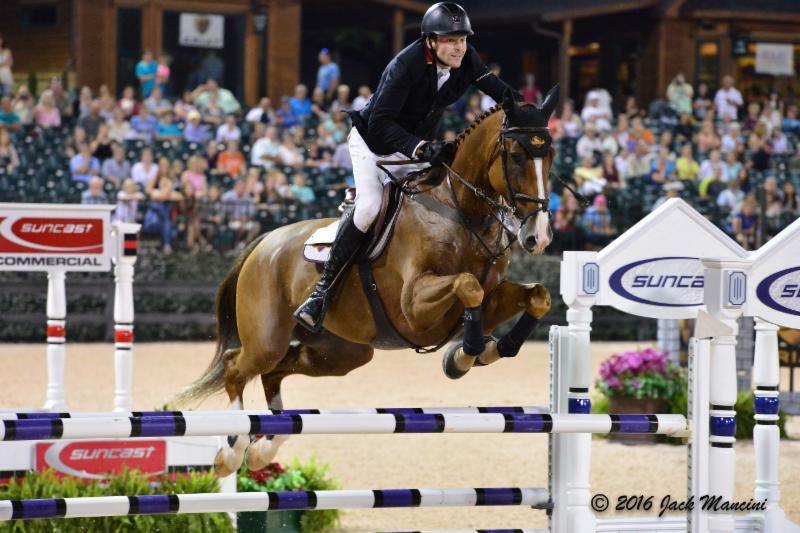 Competition at TIEC continues with Tryon Spring 7, featuring the second FEI CSI 3* of the 2016 Tryon Spring Series, beginning on Wednesday, June 1. Holloway and Cassevel sealed the win, crossing through the jump-off timers in 43.373 seconds for the win, holding off David Blake of Wellington, FL, and Binkie, in what would have been their third consecutive grand prix win at the venue. Blake and Binkie finished in 44.86 seconds, while Bryn Sadler of Sante Fe, NM, and Bon Giorno rounded out the top three with a time of 46.257 seconds. Holloway and Cassevel are a relatively new pair, as the 2007 Holsteiner gelding was purchased from Derek Petersen less than a year ago. Holloway rode with a confidence that allowed her to excel in the pressure situations that arose in the jump-off round. "We got him just over a year ago and I've taken my time with him and tried to really make him my horse. He's a great horse and won some in Ocala, FL, and he's just really consistent in the big classes. We'll do more of the FEI on him this season and try for some good results." As the first to go in the order, Holloway and Cassevel nearly didn't make the jump-off round, as they finished the track with a single time fault, but two rides later, course designer Hector Loyola adjusted the time allowed, moving the pair through to the short course. "I thought both courses rode so well. I thought there were lot of turns that you really had to ride smartly," said Holloway. "There were a few spaces of good gallop track and he has a big stride. I felt like I went in with a lot of confidence because I knew he could handle the course and it suited him." Speaking candidly of her biggest career win, Holloway immediately complimented the heart and never-ending try of Cassevel, who she hopes will help her secure top results in FEI ranking classes throughout the remainder of the year. "This was the biggest class I've ever won and it just is so exciting. It's a great feeling and it's only the second grand prix I've done with him, so this is a big result for us," she smiled. "I am really proud of how my horses performed this week and I am just over the moon right now." Hunter Holloway and Cassevel in their presentation ceremony with groom Gerardo Lopez, Sharon Decker of TIEC, alongside Howard and Gwen Dvorkin. "It's been a very cool week for us. Each one of our grand prix horses has won a big class this past week. I think it's a great feeling and it also makes you appreciate your horses. It's such a great opportunity and we're so lucky to have the rides on these guys. They're a really special group and I just am so ecstatic right now," she continued. Holloway's groom Gerardo Lopez was awarded with the Groom's Initiative Award presented by Mark Bellissimo and the Tryon Equestrian Partners in recognition of his hard work and dedication to the care of Holloway's grand prix mount Cassevel. "Gerardo is absolutely incredible with our horses and we're so lucky to have him. He takes impeccable care of them and he's the only one I trust with my grand prix horses. He understands them and does an amazing job," said Holloway. "He's such an important part of our team and I'm so happy that he was recognized for his hard work." 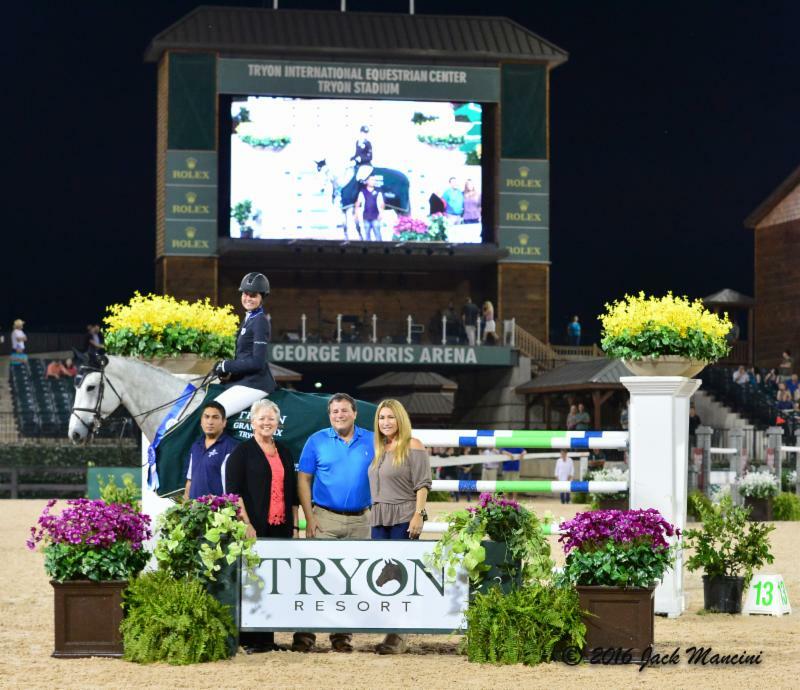 Holloway found herself atop the leaderboard once more at TIEC during Tryon Spring 6, this time after clinching the $25,000 Under 25 Grand Prix aboard VDL Bravo S. The duo finished the track in 38.426 seconds to secure the win. Bryn Sadler and Cezarro completed the short course in 42.426 seconds for second, while Holloway also piloted Cassevel to third place with a time of 42.426 seconds. "I was happy with the way the course rode and I felt like all of the questions that were out there on course I was able to answer and had a plan," commented Holloway. "I thought both of the horses felt really fit and ready to play today in this class." The Under 25 Grand Prix Series has become an incredible stepping-stone for some of the world's most talented riders under the age of 25, offering an opportunity to gain valuable grand prix experience in a competitive atmosphere. "The Under 25 Series is just a great division. It's nice having a little separation and it allows us younger kids to get some really good exposure in the bigger rings and atmospheres. In this sport a lot of the top riders are able to stay at the top of the sport for so long, I think the series is really a great way to be able to test the bigger tracks and give your horses some great experience too." "These classes give you a sense of confidence that I think is really important when you start looking at competing in some of the bigger classes throughout the year," she added. 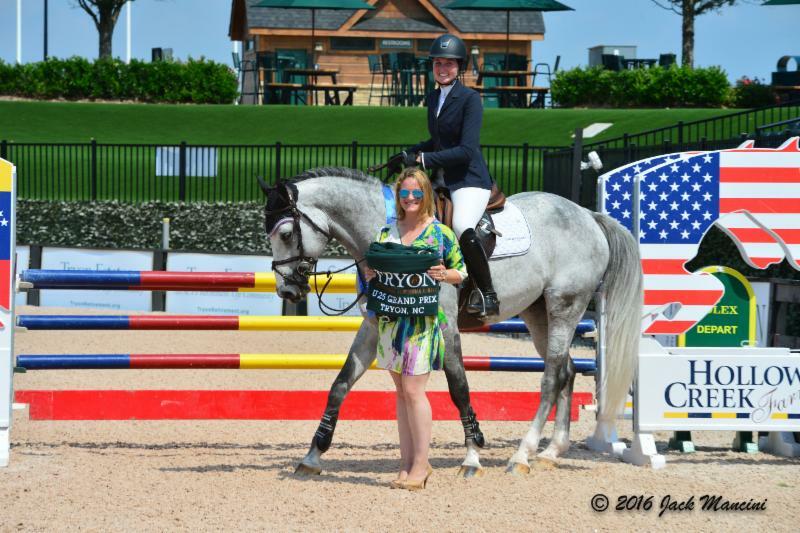 Hunter Holloway and VDL Bravo S in their presentation ceremony with Maddy Stover of TIEC. VDL Bravo S, a 2006 Dutch Warmblood gelding (Ephepe For Ever x Urbine S), has been a strong mount for Holloway and the duo have produced several top results throughout winter and spring season. Holloway feels that there is more to come from the pair, as they've just begun to find a rhythm this season. "He's an amazing horse. Just super brave and super easy to ride. I'm never really concerned with anything on course with him. We got him a little bit over a year ago and it has been a truly amazing experience," she explained. "It's a great horse and we have some truly great supporters behind us with Hays Investment Corp. and I've had a lot of success with him. I'm very excited for the future and what we have to come this season." 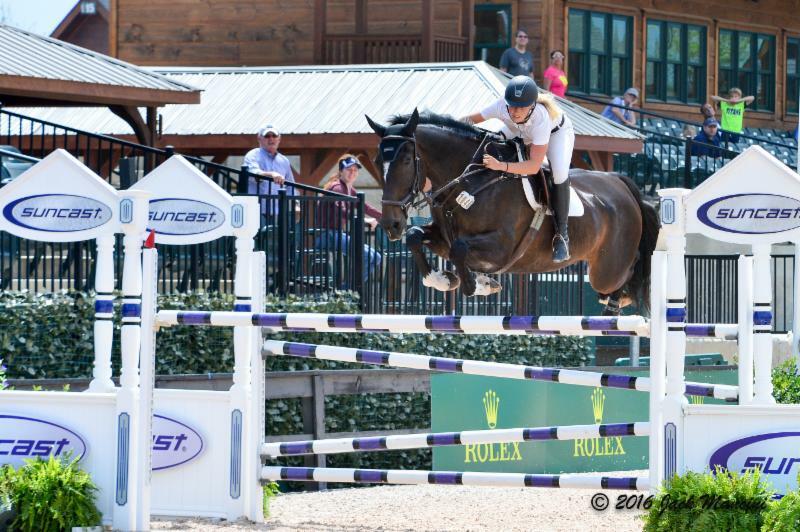 Kristen Vanderveen of St. Charles, IL, guided Lucky Strike, owned by the Hays Investment Corp. to victory in the $25,000 1.50m Suncast® Open Welcome Stake on Thursday, May 26 at Tryon International Equestrian Center (TIEC). Vanderveen and Lucky Strike finished the jump-off round in 38.551 seconds for the win, while David Blake of Wellington, FL, and Baron finished in second place with a time of 41.022 seconds. Darragh Kerins of Wellington, FL, and S&L Through The Looking Glass rounded out the top three crossing through the timers in 41.76 seconds. Lucky Strike, a 2006 Holsteiner gelding typically campaigned by Brandie Holloway, found his way to the winner's circle with Vanderveen in the irons after Holloway was recently sidelined with an injury. The pair bested 10 combinations that returned for the jump-off round, while six pairs finished the afternoon with a double clear effort. Hunter Holloway of Topeka, KS, continued her dominance in the jumper ring, earning the Ariat Junior/Amateur Owner Jumper 1.30m division aboard Avant Guarde, owned by Serenity Ridge Farm. Holloway also collected reserve champion awards aboard Deluca Ace owned by Amy Hunter. The $1,000 Junior Hunter 3'3"/3'6" Classic saw Hunter Holloway of Topeka, KS, and Entourage, owned by Hays Investment Corp., finish atop the leaderboard with a score of 175. Holloway also piloted The Governor, owned by Hays Investment Corp., to second place, with a two round score of 166. 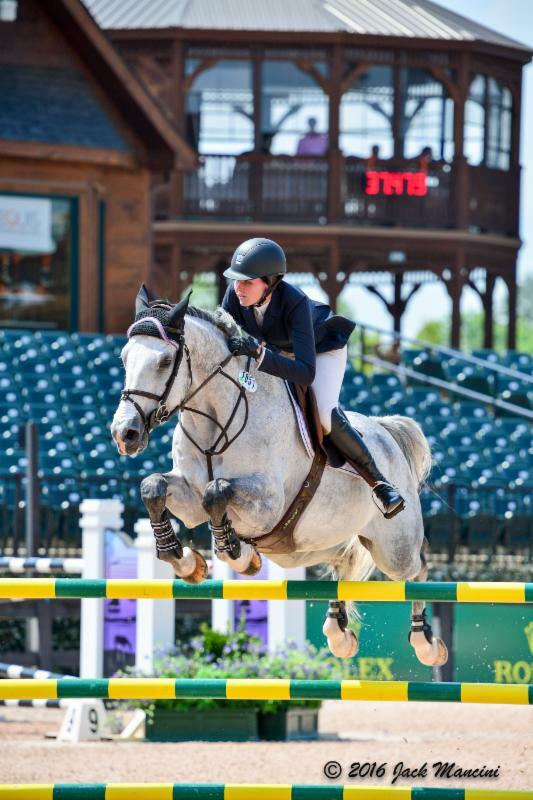 Equi-Venture Farm's Hannah Loeffelbein and Watch Me, owned by Two Point Equestrian, LLC, took the ASPCA Maclay.